My nephew took this photo on vacation. 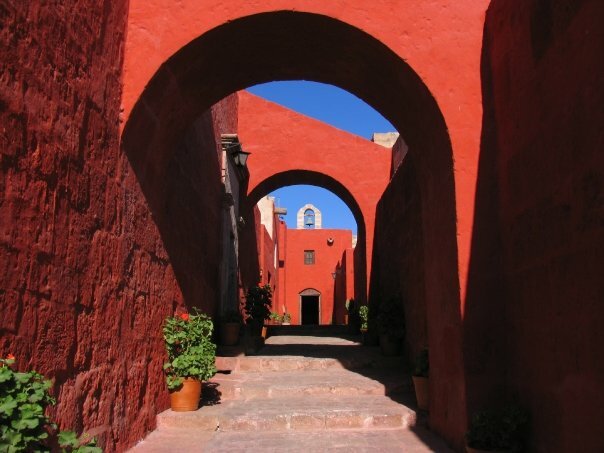 A marvelous combination of REDs and black.Looks like a Spanish town to me... Any one know what town this is? What lovely arches! I love the contrast of black on red. beautiful place and brilliant colors too. happy ruby tuesday! I have no idea about the town or the country. Had the walls been white, I'd go for Greece. It's too dark to be Venice...Morocco perhaps? i love the light and shadows and the red walls. is this in Mexico? It's beautiful, wherever it is. It's surprising that it is so red, but otherwise it's impossible to say where it is, because all these little towns look the same, lol ! Your nephew captured it well. Happy RT. Btw, the rock band sounds like FUN! I'll try it someday! Thanks Mary! What a beautiful shot, wherever it is! Perfect for Ruby Tues.
thanks for hosting. I enjoy it so much. Beautiful pic! The red is so vivid! Beautiful photo. Could it be somewhere in California? Beautiful shot, the arches are lovely. I take a guess and say a town in Mexico. What a wonderful photo! You hardly ever see that shade of red around here. beautiful place.... color is so rich. Happy tuesday. The bits of bright blue among the red is fabulous! Happy Ruby Tuesday. This is a stunning capture indeed. Love the photo but I have no idea what town it is! It does look Spanish. Do we get a clue? The colors are awesome, so vivid. looks like a spanish pueblo:))) love the rustic color of the walls. wow so wonderful photos out there. Oops I do not know what town is that but for sure, it is pretty REDS! I love it! marvelous combination of reds, indeed. this is picture perfect. Somewhere in Europe, I guess lol. nice picture, so red. mine is up! happy ruby tuesday! It's a place I would enjoy visiting, but have no idea where it is. I'm guessing New Mexico, though. Wonderful shot. I always find it interesting wht everyone chooses to share. Thank you for hosting. I have a WILD Ruby Tuesday photo today. Getting in Valentines Day mode! Thanks for manning this meme. I see you've generated lots of comments. That is a stunning red that you offer us today. It is just beautiful, Mary. I can also see a beautiful, clear, vivid blue sky! Love the russet tones in the buildings! My RT is up too. See you got quite a few this week! Must be we all need some Ruby in our lives to cheer up our January! Wow! I am late today! What a BEAUTIFUL set of arches... It would be wonderful to know where this is! Stunning Pic ! Happy Ruby Tuesday! nice place, happy ruby tuesday! It is indeed a beautiful contrast of light and bright and shadow. I'm guessing, without knowing the answer, that it's in New Mexico somewhere.